In this post, we will see ITR Form selection in Saral Income Tax for Individual / HUF Assessee. Individual / HUF Assessee can file their returns in 4 different types of forms depending on the type of income received by them during the financial year. Hence, it is very important to select the right ITR form for return filing. In Saral Income Tax, the process of selecting the applicable ITR can be auto by providing the details of the type of income by the Individual/HUF Assessee. Go to Assessee Master Screen and enter the basic assessee information like Name, PAN, Date of Birth, Assessee Status and Residential Status. 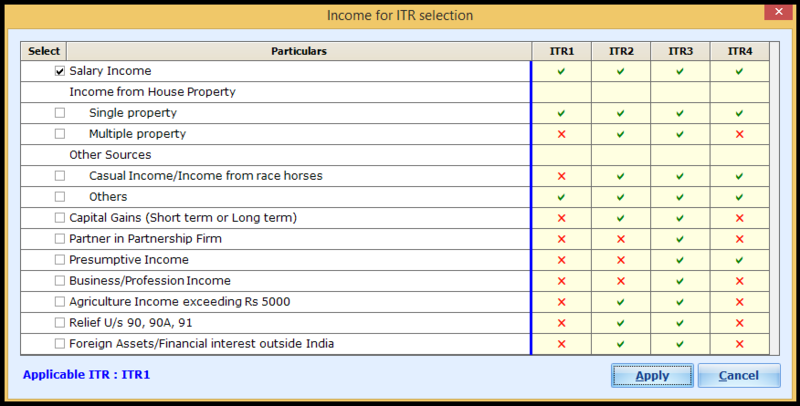 In the drop-down of ITR Form, 4 types of ITR form will be listed for selection. Click on “…” button next to ITR Form field. The different income selection window will be displayed. Also against each income, the type of ITR applicability is also shown. Here, tick the income received in the particular financial year. 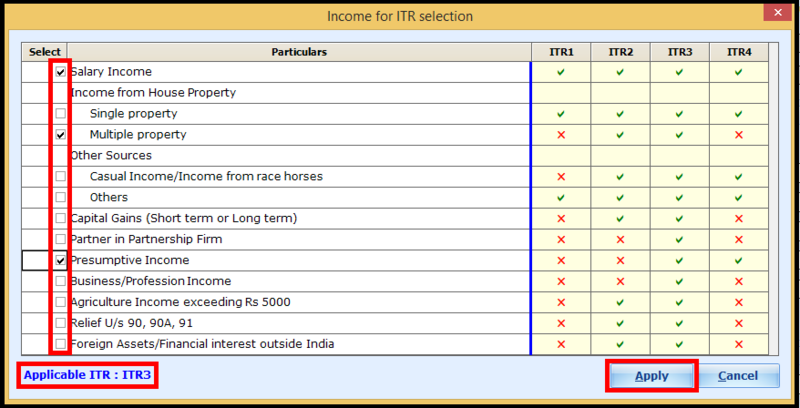 So, according the applicable ITR form will be displayed in the lower bottom on the window. After selecting all the applicable incomes, you need to click on Apply to apply and select the applicable ITR form. Now, the applicable ITR will be selected in the Assessee Information screen. Then, continue to enter the remaining information’s and save the details. This option is available only in case the Assessee Status is Individual/HUF. In other status, this option is disabled due to single form type for ITR filing.